From lacto-fermentation to high pressure processing, preservation techniques old and new are paving the way for juices that cater to healthy eating and clean labels. The intersection of flaky fads and mainstream tastes depends on the product category. When it comes to juice, the trend clearly is cold-pressed. With shopping mall kiosks and the local supermarket standing ready to crush your favorite fruits and vegetables on demand, there’s plenty of opportunity to indulge a taste for cold-pressed juice. But Americans are a mobile people, so the portability and convenience of processed products is strong. Healthy eating is all well and good, but putting it in a cleanly labeled bottle for on-the-go consumption is the key to mass market sales. Reliable numbers don’t exist, although some cold-pressed juice insiders peg annual category growth at 19 percent through 2020. Detox dieters already are on board, so growth will come from casual consumers buying in to better-for-you benefits and good taste. There are many ways to extract the essence of fruits, vegetables and herbs. The distinction cold-pressed proponents make is the relatively benign squeezing of ingredients between plates or belts in a refrigerated environment to ensure minimal rupturing of cell walls, as opposed to the heat and mastication of impellers in a mechanical process. Oxidation and enzymatic activity continues after extraction, and the juice will go bad within five days, even with refrigeration. Additional processing is required, and high-pressure processing (HPP) is the go-to technology for cold-pressed juices. Oeiras, Portugal-based GL SA (www.glsa.pt) exemplifies this approach. The firm began exporting cold-pressed juices in PET bottles to the East Coast in late 2016, according to Chairman Douglas Gilman. Some processors constitute their drinks with purees, he says, “but we only use whole fruit.” After pressing, the juice, sold under the So Natural name, is subjected to 6,000 bars (87,000 psi) of pressure in one of the firm’s three Avure HPP presses. Boasting that So Natural is Europe’s No. 2 cold-pressed juice and No. 1 in HPP, Gilman says the process provides 80 days refrigerated shelf life, enabling export to Dubai, Singapore, Hong Kong and points beyond. Transport by boat from Lisbon, Portugal, to New York harbor takes 10 days, leaving ample time to distribute and sell the 30-some single-serve varieties. Twelve-ounce bottles and concentrated shots such as beet root and 20 percent carrot with flavorings such as turmeric, ginger and mango are formulated. GL was Europe’s first commercial user of HPP technology, he claims, commissioning its first press in 2003. Except for the flavorings, all ingredients come from within 100 miles of Oeiras. The company sources apples from its own orchards, and other fruits and vegetables are grown from its seeds and under the supervision of GL personnel. Here Holdings (here.co) in Chicago is taking locally produced even further, limiting distribution of its cold-pressed juices to the Great Lakes region. Five varieties of the 12-oz. beverages started appearing in refrigerated cases at Mariano’s and Treasure Island supermarkets in April, with a suggested retail price of $5.99. Twelve-month production and raw material sourcing in northern Illinois would have been a pipe dream five years ago, concedes Megan Klein, president of Here Co., the retail brand's owner. “Before we did anything, we secured the supply chain,” she says. Here’s existence is testament to a rapidly evolving supply chain that includes greenhouses, hoop houses and vertical urban gardens. Most of Here’s drinks include apples, which are sourced from Bellharvest Sales Inc., a southwestern co-op and pioneer in 1957 in controlled atmosphere storage of the fruit, but most ingredients are grown closer to home. Mighty Vine, a 15-acre hydroponic greenhouse 80 miles away in Rochelle, Ill., harvested its first crop in 2015 and now produces close to 1 million lbs. a month. The Plant in Chicago’s Back of the Yards neighborhood and Chicago Indoor Gardens provide a steady supply of zucchini, pea shoots, wheatgrass and other ingredients. Klein was one of those urban farmers until January when Here Holdings was formed. Besides the retail brand, the company includes 87P LLC (87p.me), her former copacker in Carol Stream, Ill. The name is a reference to HPP’s typical 87,000 psi operating pressure, although the plant only presses and blends fruit and vegetables. 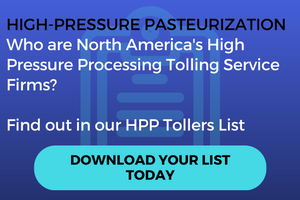 HPP pasteurization is done in Milwaukee, with a tolling operation in Bolingbrook, Ill., providing a closer option. Founded in 2013 by entrepreneurs with no prior food industry experience, 87P shifted exclusively to copacking of cold-pressed juices two years ago, says President Bill Besenhofer. Beginning with a single press, the facility now has 13 and serves clients as far away as the West Coast and in northeastern states. Initial expiration dates are 45 days from processing. “We could get 60-day shelf life and probably will, but I wouldn’t want to go to 80-90 days,” says Klein. Micro ingredients in cold-pressed juices usually include so-called super foods. The humble beet has been elevated to super status, so it’s no surprise a number of cold-pressed beet juices are appearing on grocers’ shelves. Beetology is among those recently launched. Bayonne, N.J.-based Kayco (www.kayco.com) introduced five varieties in May. Raw materials and production are in Turkey, where company officials sourced a high-brix beet variety that doesn’t impart the “earthy flavor” that causes some potential drinkers to avoid beet beverages, according to Charles Herzog, vice president-new business development. Post-extraction, the juice is flash pasteurized and hot-filled in glass bottles sculpted to evoke slices of beets. Kayco commissioned the molds used to make the bottles. The product has a 12-month refrigerated shelf life and a suggested retail price of $3.99 per 8.5 oz. bottle. Beetology features organic ingredients, as does Biotta AG (www.biottajuices.com), a Swiss manufacturer that doesn’t shy away from health claims. The firm, which began producing organic juices in 1957, began shipping in April a non-GMO Apple Beet Ginger juice, its first beverage that blends fruit, vegetables and herbs. All juices are produced at Biotta’s facility in Tagerwilen, Switzerland, with the exception of 32-oz. bottles. Label claims are limited to “100% juice” and “no sugar added,” with references to studies supporting health benefits such as reduced inflammation, gout prevention and the like. Instead of pressing, Biotta uses centrifugation to separate the juice from the mash. The closed processing system is oxygen free to minimize the likelihood of microbial contamination. With low-acid vegetables like carrots, lacto-fermentation is used to lower the pH prior to pasteurization at approximately 200° F before bottling. A 16.9-oz. (500ml) bottle retails in the range of $4.99-$6.99. Whether it is produced with a press or a separator or is shelf-stable or refrigerated, functional juices are enjoying growing demand. Some of the leading brands essentially are purees, while others rely on processes that separate the juice from the mash. Regardless of the process used, the resulting cocktails of vegetables and juice are formulated with increasingly complex blends that cater to multiple taste preferences and desired health outcomes. It’s a big departure from the mass produced and relatively simple formulations that have dominated the juice category for decades. Multiple price points and target audiences ensure that product innovation will continue at a rapid pace. Cold-pressed beverages are coming on strong for processors.